Overpriced box sets appear to be the theme of the week over here! The latest Hasbro Star Wars Black Series 6-inch box set is an Amazon exclusive that includes three astromech droids: R2-D2, R5-D8, and R2-X2. Remember those names because there will be a quiz at the end! All three of the droids sport a “weathered” deco to different extents. However, R2-D2 gets it the worst as he looks like he’s been pulled out of a portapotty. Believe it or not, this is actually my first experience with the Black Series astromech mold. Thus it took me a second to figure out its action feature to lower the middle leg. In case you are completely oblivious like me, the leg lowers when you spin the head section of the droid around. In addition to that, each droid has two panels that open up to reveal their little robotic arm attachments. Maybe I’m just not very perceptive and this is common knowledge, but I never knew that the R5 units shared the same body with the R2s. I was shocked to find that the R5 model was, in fact, just a new head! This rocked my world quite a bit. So anyway, where are all of these droids from? R2-X2 was the astromech droid for Theron Nett aka “Red Ten” in the Battle of Yavin. Sadly R2-X2 was destroyed in the battle. Another casualty of Battle of Yavin was R5-D8. R5’s pilot was the infamous Jek Porkins, who is also dead. I’m not going to lie, I want a 6-inch Porkins. I want it bad. I’m actually a bit shocked that X-Wing Luke is the only rebel pilot we’ve gotten in the line so far. The reuse potential of that body is kind of huge, isn’t it? For obvious reasons, Porkins would require an original sculpt, but there are plenty of other pilots that you could plop a new head on. Face-printing is my jam, and you’re damn right I’d get every last one. Finally R2-D2. Without even going back and watching the movie, I’m going to assume this deco is from the Battle of Yavin as well. Sadly this release comes with none of the fun accessories that the original did. 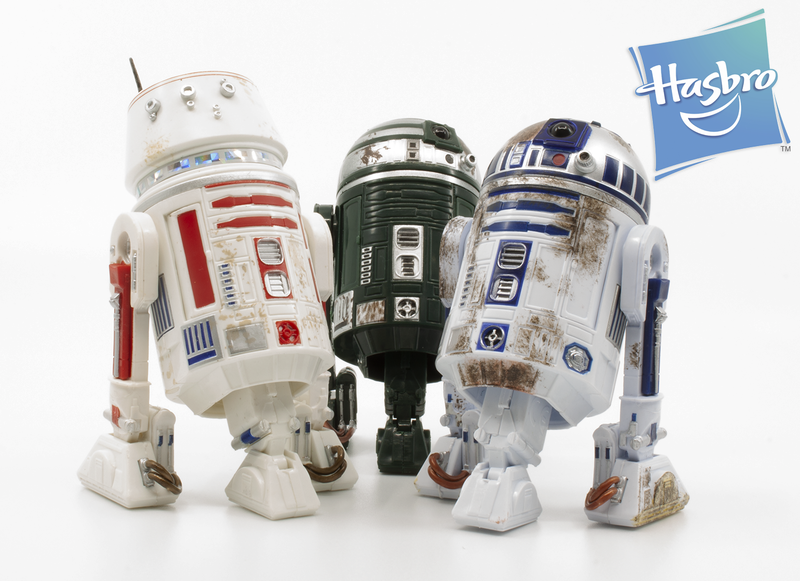 Would I suggest the Star Wars Black 6-Inch R2-D2, R5-D8, and R2-X2 Red Squadron Box Set? Eesh. As figures, all of these astromech droids are fine. However, you are paying the full single figure price for each one since the set’s total price is $60. On top of that, no accessories are included here. Three droids. Sixty dollars. Yep! I recall years back when the real advantage of a multi-pack of action figures was that you saved a little money by buying in bulk. I’ve come to accept that this no longer is the case, but this set is a more egregious example of how the times have changed. So would I recommend this set? Not at full price. Wait for a sale. That’s what I should have done. If you can’t wait or just want to bookmark it, the Amazon link is right here. Hey Hasbro, give Amazon a three-pack of these droid’s pilots next year. I’d be a lot more willing to pay $60 for that!